Posted by Dave Emory ⋅ March 29, 2015Post a comment Email This Post Print This Post Tweet This! We resume our dialogue with Peter’s analysis of how the global jihad stratagem hatched by Max von Oppenheim and the view on the Arab street that they were the victim of a global international conspiracy were utilized by the Third Reich and Haj Amin al-Husseini, who recruited Muslims to serve in Waffen SS formations for Hitler. After the war, the Grand Mufti and Islamic fascists continued their networking with the “Underground Reich” that arose from the Nazi diaspora. Many ardent Nazis converted to Islam. In that context, we note that the post World War II period saw the continued development and refinement of a militant Islamism that had a degree of ideological resonance with fascism and Nazism. Next, Peter makes a very important point about “neo-Nazism”–that it isn’t “neo” at all, when the leaders of the movements are active alumni of the Third Reich. Many of those involved in the formation of “neo” Nazi organizations were doing so while employed by Western intelligence agencies. The renascent Nazi movement had, as one of its epicenters, Colonia Dignidad. (Peter discussed his hair-raising visit to that outpost in FTR #839.) In addition to receiving funding from the Nazi economic diaspora, Colonia Dignidad served as a respite for war criminals, a torture center for Augusto Pinochet’s fascist dictatorship, a development facility for WMD’s and one of the centers for the execution of Operation Condor. Condor was an assassination consortium of Latin American dictatorships, which received active assistance from elements of U.S. intelligence. Colonia Dignidad embodies the dual use by the postwar “Underground Reich” of its operational networks in conjunction with its alliance with Western intelligence, U.S. intelligence in particular. An important point of analysis concerns Otto Ernst Remer, an SS officer who became prominent in the postwar Third Reich underground. The fact that the Hanjar Division-13th Waffen SS, among other Muslim Waffen SS formations, was formed by the Grand Mufti. Both viewed much of contemporary Western culture as “decadent,” citing social and sexual morality, contemporary jazz and popular music and artistic and musical genres as symptomatic of social decay and factors that undermined society. Islamism is–by definition–an international movement and Nazism became that. Otto Ernst Remer became a key operative, building on his role in liquidating the conspirators against Hitler, establishing the Socialist Reichs Partei, working in the Middle East with the likes of Eichmnann aide and BND officer Alois Brunner. Nazis in the Middle East worked with North African liberation movements. This was a third attempt at establishing global jihad and involved people we will discuss at greater length in programs to come, including Ulrich Rudel, and Francois Genoud, both of whom will be discussed in the next program. Omar Amin von Leers. Escaped first to Latin America and then Egypt. Worked directly with Grand Mufti. Gehlen Organization was the vehicle for the injection of many of them into the Egyptian and other Arab countries’ national security establishments. Nazis were heavily involved in developing guided missiles and weapons of mass destruction to be used against Israel. Achmed (Nee Albert) Huber: protege of the Grand Mufti and von Leers, he became a link between Islamists and contemporary Nazis. Nazis in the Middle East worked with North African liberation movements. This was a third attempt at establishing global jihad and involved people we will discuss at greater length in programs to come, including Ulrich Rudel, Hjalmar Schacht and Francois Genoud. 4. Peter makes a very important point about “neo-Nazism”–that it isn’t “neo” at all, when the leaders of the movements are active alumni of the Third Reich. Many of those involved in the formation of “neo” Nazi organizations were doing so while employed by Western intelligence agencies. The Hitler Legacy by Peter Levenda; IBIS Press [HC]; Copyright 2014 by Peter Levenda; ISBN 978-0-89254-210-9; p. 165.
. . . . As mentioned previously, there is nothing “neo” about so-called “neo-Nazism” if the leaders of the movement are all members of the original Nazi Party and held various ranks in the Nazi government, the military, the SS, and the espionage services such as the Abwehr, the Gestapo and the SD. There is a continuity of personnel, financing, and ideology that enabled these men to shift their theater of operations from western Europe to eastern Europe, the Middle East, Latin America, and Asia. Further, there existed–and still exists–a support structure of sympathizers and political operatives that enables the survival of these individuals and their philosophy, transferring their ideals to a younger generation capable of promoting the Nazi message in new media with subtle alterations of “spin” and, in addition, willing to commit the violent acts necessary to demonstrate their dedication to the cause. In this they are no different from the support systems and methods enjoyed by the Islamist jihadists. . . .
5. The renascent Nazi movement had, as one of its epicenters, Colonia Dignidad. (Peter discussed his hair-raising visit to that outpost in FTR #839.) In addition to receiving funding from the Nazi economic diaspora, Colonia Dignidad served as a respite for war criminals, a torture center for Augusto Pinochet’s fascist dictatorship, a development facility for WMD’s and one of the centers for the execution of Operation Condor. Condor was an assassination consortium of Latin American dictatorships, which received active assistance from elements of U.S. intelligence. 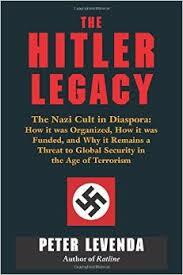 The Hitler Legacy by Peter Levenda; IBIS Press [HC]; Copyright 2014 by Peter Levenda; ISBN 978-0-89254-210-9; pp. 171-172.
. . . . This remote Andes mountain estate–with its barbed wire fences and guard towers, designed after the ones at the concentration camps was just another element of ODESSA, albeit one of is most elaborate. It had hosted Skorzeny, Rudel, Mengele, and many other notables–both before the author had inadvisably paid it a visit and long after. Its utilization as a laboratory for the manufacture of WMDs is proven: there is there is photographic, video, and eyewitness testimony to the fact. Yet there has never been any outcry by Western intelligence or military experts over this; never any condemnation from the White House or 10 Downing Street; no slide presentations before the UN Security Council. How much of this information and lethal capability was shared with Skorzeny’s and rudel’s jihadist counterparts (and clients) in Afghanistan, the Middle East, or Pakistan? . . . The Hitler Legacy by Peter Levenda; IBIS Press [HC]; Copyright 2014 by Peter Levenda; ISBN 978-0-89254-210-9; p. 155.
. . . . It was Remer whose role in stopping Operation Valkyrie—the assassination attempt on Hitler’s life and the resulting military coup—made him one of Hitler’s most trusted generals. Working alongside Remer in the aftermath of the assassination attempt, and the ensuing roundup and execution of its participants, was Ernst Kaltenbrunner and Otto Skorzeny. . . . .
. . . . Remer, not content to remain in the background during the Cold War, cofounded the Socialist Reich Party on October 2, 1949, an openly pro-Nazi party that was eventually banned by the West German government about two years later. Regardless of this setback, Remer remained a profound influence on the underground Nazi movement for the rest of his life, and helped to formulate a “third way” philosophy for the generation of Nazis who would come after him, a philosophy that involved support for a variety of pro-Arab and pro-Islamist movements. While rejecting both communism and capitalism, the “third way” Nazi philosophy could appeal to a wide variety of groups that felt victimized or oppressed by the super-powers that were largely perceived as new colonialist regimes. . . .